Dave Pruim, the Wild Boars 2nd year veteran right handed pitcher, notches his first victory of 2019, and the gets the first Boars win on Opening day in Team history. 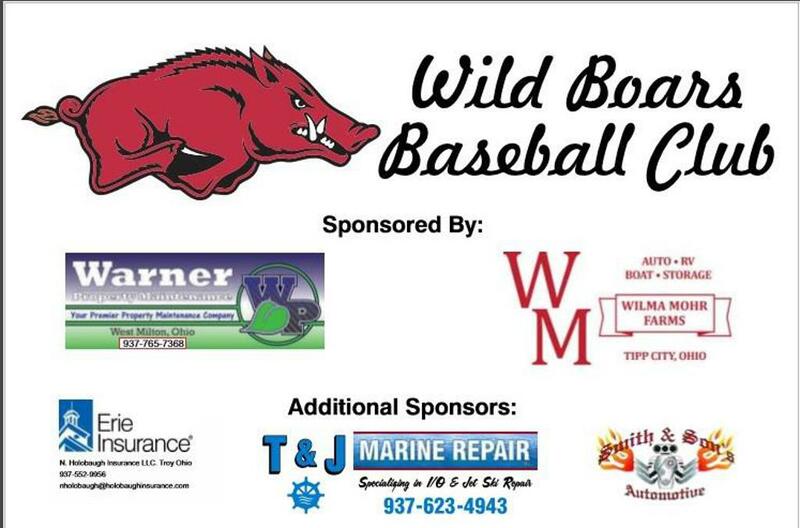 The Boars and the Machine squared off on opening day 2019 And the Boars came away with the win 13 to 2, over last years MVABL League season runner ups, The Mad River Machine. The Boars struck in the bottom half of the 3rd, after both teams went quietly through the first 2 innings without scoring. The Boars J.R. Nixon laced a double off the fence and later scored off an RBI single by Boars Shortstop Markus Hall. Dave Pruim helped himself reaching after an error and Jimmy Herold was issued a base on balls. New rookie Sean Johnson, added an RBI single. 2nd year player and 2018 Boars team MVP Dylan Pletsch cleared the bases when he hit a ball to the fence collecting 3 RBI's and standing up into 2nd. Pletsch later scored after stealing 3rd, and was drove in by Gary North the Boars Catcher. The Boars led 6 to 0 after 3 innings. The Boars added 1 in the 4th inning and 2 in the 5th inning after Sean Johnson hit a double and scored on a SAC fly by Sully Minner, Dylan Pletsch scored again on the single by Gary North. Boars lead increased to 9 to 0 over the Machine. Dave Pruim pitched 5 complete giving up 1 hit, 1 BB, 0 runs, and striking out 7. gave way to Boars new Rookie pitcher Sid Srinivasan, who picked up where Pruim left off. Striking out 2 and inducing a pop up to 3rd baseman Jimmy Herold. An error allowed the Machine's first run in the 7th but the Boars added 3 more of their own off a single by Markus Hall, and a HBP to Sean Johnson and Dylan Pletsch having a monster day drove them in with a triple. Sully Minner drove in Pletsch and the Boars lead increased to 12 to 1. Brandon Lucas was brought on to close the game in a non-save situation allowed 1 run after a walk a stolen base and a fielders choice. Brandon struck out the last 2 batters he faced Boars first win on opening day in franchise history 13 to 2. In all 3 Boars Pitchers combined for 9 innings with 2 runs, 1 earned, 3BB, 2 Hits, and 13 Strike outs. Wild Boars Defensive player of the game was Markus Hall with 2 put outs and 5 assist and 0 errors. The boars will return to action next week at Gastineau field in New Carlisle, Ohio against the Kettering Royals, come out and catch a game. ©2019 Miami Valley Adult Baseball League / SportsEngine. All Rights Reserved.